NEW YORK CITY’S BEST SUNDAY WORKOUT. Starting THIS SUNDAY – October 16th I’ll Teach the 10am-11am FULL-BODY EXTRAVAGANZA! Why? : Because you miss me and you want to get you’re a** Kicked GOOD RALLY the troops Retro STYLE!!! It’s like the Double on Sunday at 19th Street, REUNION of Full-Body Madness! Reserve Your 3 Sunday Full Body SWEAT-FESTS! If you’d like to Pre-Register for The 3-Pack Sunday FIESTA before the Masses catch wind call 646.559.2721! Just say I’d like to secure my spot for Lacey’s Sunday 3. 3 Pre-Registered Classes = $100. AND… YES, I will continue to teach my Regular Schedule of Monday/Wednesday/Friday from 12.30-1.30!!! Here’s how you can get your weekly spots or get in on the Sunday FIESTA! http://www.barrysbootcamp.com/nyc-pricing-schedule.html or call 646.559.2721… Lets RUN THIS MUTHA BiooAtTTCCHHESSS!! P.S. BUST BOOTY and then ENJOY BRUNCH After w/ me at BARRRRYYYY’s in ROCKtoBER! WHICH SYMBOL DO YOU LIKE BETTER? Thank you for all your feedback yesterday… It’s between the Symbol in the A and the Pink Symbol at the end. Now I’m trying to decided between symbols… Which one do you like better? This will become my business cards, stationary, and the actual picture will be the lead picture on my new and improved Lacey Stone Fitness Website… Important decisions and I would love your feedback! I WOULD LOVE YOUR OPINION. If you were to count in rows… Row 1 being 1, 2, 3, 4, , and Row 2 being 5, 6, 7, 8 I think my favorite is 7… How about you? PS The AMAAAZZINNGGG person who came up with these is Flora Guillon… If you’re looking for someone to help you create your logo she’s the one, GREAT to work with -Flora.Guillon@gmail.com. 4 CHANCES FOR ALL OF US TO SPIN IN OCTOBER!!! Have you ever been to a sunset spin class on a rooftop in Dumbo? A jog through the MoMa or an aerobic kick-boxing class up on the High Line in the Meatpacking District? I’m so EXCITED to be a part of the launch of KiwiSWEAT a pioneer in creating the highest quality fitness in unique destinations to transform the ho-hum workout routine into the premier fitness experience. KiwiSWEAT’s inaugural SPIN EVENTS will take place this month in Chelsea Market and you’re invited!! These are my 4 SPIN SESSIONS – LETS DO THIS! 4. Saturday, October 29 – 10:00AM – 10:45AM – PRE-HALLOWEEN MADNESS!!! Learn more about me and other KiwiSweat Instructors – http://www.kiwisweat.com/experience/instructors DO IT. What are you waiting for? I hope you are enjoying your Labor Day Monday… What a Summer?! September is the month we get back on that horse. It’s about taking work, love, and fitness back into a regular super effective routine. I can help you BLAST back into your FITNESS Prowess New York City!!! So much to share this month: BARRY’S BOOTCAMP NEWS, Motivational Seminar, Good Morning America and much much more!!!! Barry’s gives you the opportunity to Train with me… Lets ROCK that BODY!! What’s BBC?! : Barry’s has been a HUGE Staple in Los Angeles since 1998 known for busting people’s booties and Sculpting Hollywood Stars. Britney Spears, Kim Kardashian, and Amanda Seyfried have been quoted as saying Barry’s is their #1 go-to Workout. The Bootcamp: All Barry’s Bootcamp classes are one hour, and each class includes 25 to 30 minutes of interval cardiovascular routines on the treadmills and 25-30 minutes of strength training using free weights and other equipment. LIVE TOUR: Let me take you on a LIVE Tour of BBC – http://www.youtube.com/watch?v=EbuHUbHzPtc anndd Fall into Fitness this September with The World’s BEST Workout and me! G Series FIT: Check out my LIVE chat on The G Series FIT Channel – http://www.ustream.tv/recorded/17026546We talk Tight Booties, Toned Arms, and just about everything else! MOTIVATIONAL SEMINAR: On Saturday September 10th you’re invited to get all the tools you need to get the Body you’ve always wanted. Get the truth and the motivation on everything you need to know about weight training, fat loss, goal setting, and nutrition. Anything you need to know we are going to share with you. Nutrition Expert Marissa Lippert and I will be BRINGING are BEST! 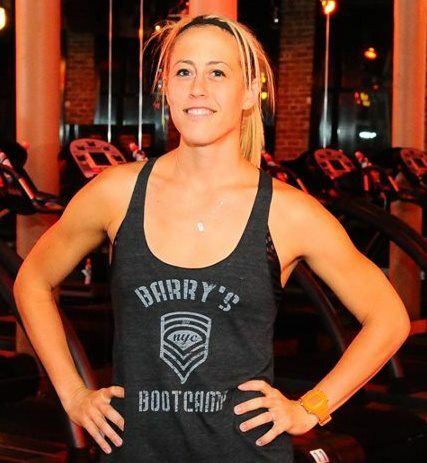 BARRY’s BOOTCAMP – Thursday Nights Barry’s EVENT was a Sold-OUT Smash Hit Home-run!! LOTS of you came and ROCKED IT. Stay tuned for special events and thank you for BRINGING IT Team! 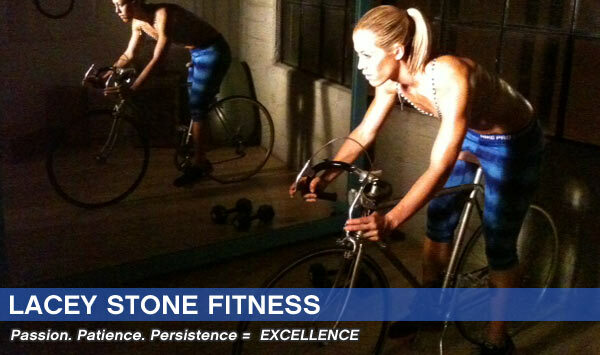 LACEY STONE FITNESS RELAUNCH! The photo shoot in LA Rocked! I can’t wait to share my new site with you: LS Method, Bravo/MTV/GMA galore, I have lots of tricks up my sleeve…Stay in the know of all things FUN – Join the Lacey Stone Fitness Page on Facebook and follow me on Twitter @laceystoneFIT for up to the minute news! In my opinion Fitness is Life… It’s about making a conscious choice to be the best you can be every minute, of every second, of every day no matter what. It’s about BRINGING IT to the best of your ability in all situations, no excuses… It’s about making being your BEST a habit. Because when something becomes a habit you can’t not do it, right? Make being your best everyday… The only option, make it just the way it is. Fitness is Life… Make it a habit. *Workout MUSIC – September Top10! I’m here all MONTH ready to introduce you to New York City’s Hottest NEW Workout! Listen, if Kim Kardashian can do it, so can you. Lets bust it people. M/W/F: 12.30pm-1.30pm Barry’s Bootcamp is the workout to attend! I remember watching this video for the first time in my college dorm room. “Here’s to the crazy ones, the misfits, the rebels, the troublemakers, the round pegs in the square holes, the ones who see things differently…” http://www.youtube.com/watch?v=dX9GTUMh490… Think different. GET IN SUMMER SHAPE with ME! I have 3 opportunities to help you get in the BEST Summer Shape of your life! Lets make it happen together. WELLNESS EVENT: GET in SICK SUMMER SHAPE! On Saturday May 14th you’re invited to get all the tools you need to get in SICK SUMMER SHAPE. Get a tips on everything you need to know about weight training, fat loss, goal setting, and nutrition. Anything you need to know, ask awwaayyyyy…. Sharon Richter and I will be there to field all questions! Have you ever had a question you’d like to ask me about your fitness? Today’s your opportunity to ask me anything and everything online! Topic: Getting in Shape for summer (tips and discussions about exercise, nutrition, and wellness). How: Go onto Facebook, Like the Ideeli Page and join in the conversation! BOOTYCamp! May has ROCKED! Email me today if you’re interested in getting in on the action in JUNE. There are 10spots left and I’d love to have you! 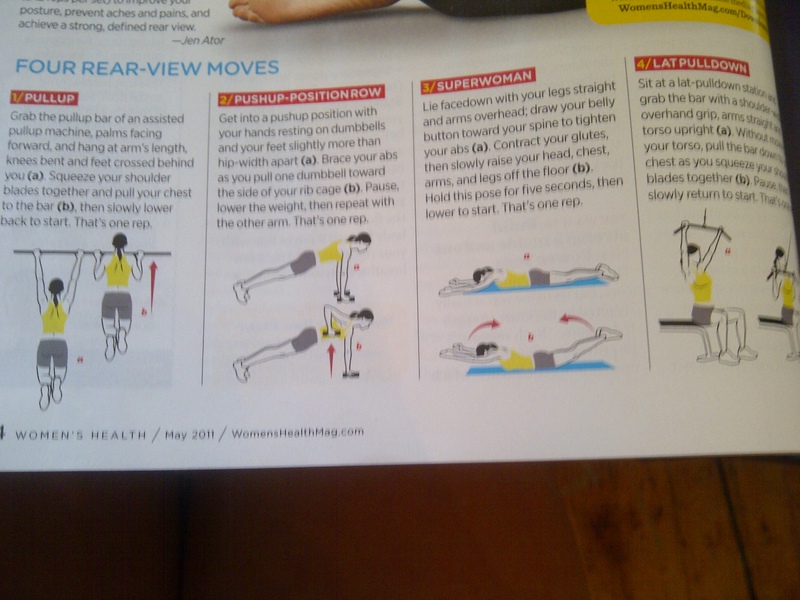 Lacey’s in Women’s Health Magazine!